Click on Editor tab on the module bar to open AV Wave Editor. Click Open File button on the toolbar to import a song into AV Wave Editor. Play the song by pressing Play button on the Player panel. 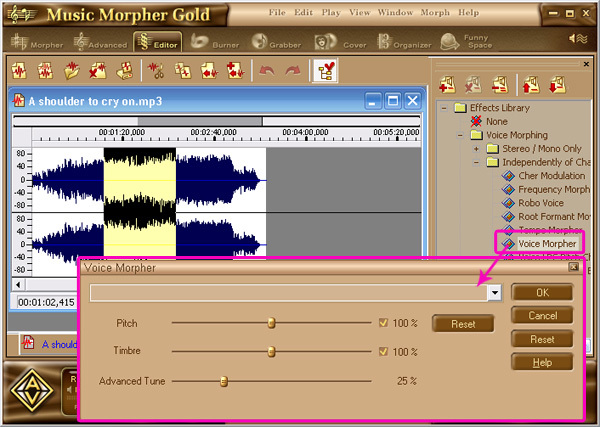 Listen to it carefully and select a part of vocals to morph by clicking and dragging the mouse. Listen and dragging the mouse to select a part of song that you want to morph. Select Voice Morpher effect and make adjustment on Pitch and Timbre as your desire. Press OK and wait a moment for the program to process voice morphing. Play back the song to see the result. Remember to choose None in the Effect Library so that the voice cannot be morphed twice. Select some more parts of the vocals and morph voice with the same setting as above. Click File on the menu bar and choose Save to have the modified audio sample overwrite its original copy. Or Save as to create a new file leaving the original song intact. Now a brand new duet is available for you to enjoy.